Elizabeth Orr is a strong woman. A stranger might not think that to look at her: Nearly 81 years of living have bent her already-petite frame, and constant pain in her legs - she refuses medication - has hobbled her walk. Her voice, with its vestigial English accent, is sweet and soft. But this is a woman who has worked long hours, seven days a week, for more than four decades in her aptly named Everyday Bookshop. She labored alone for many of those years, lugging heavy piles of newspapers, magazines and books. A friend calls her a "tough cookie" who never takes a day off. This is a scrappy shop owner who has startled more than one thief by running after him and screaming. Orr used to run for the physical pleasure of it, too - she was an avid jogger. She practiced tai chi and liked to dance. And she walked from her home on Spear Street to downtown Burlington and back again, nearly every day, until the leg problems began. Orr hasn't owned a car or wanted to. Walking home one day some half-dozen years ago, she was struck by one. According to a friend, she got up and kept walking. Orr has resisted the hegemony of technology, relying on an old-fashioned adding machine and cash register or, often, just a pencil, a scrap of paper and long-practiced arithmetic. She has ordered her merchandise not on a touch-screen computer but on the telephone. This anachronistic behavior has made many a young customer incredulous. This is a feisty, independent, resilient woman who has staunchly faced big-box competitors, rising prices, declining resources and the fickle habits of the reading public. But it may take all the strength she has left to face the biggest challenge of all: stopping. Everyday Bookshop will close at the end of the month. Or maybe in April. "I'm not sure exactly when," Orr says with a rueful smile. "I just keep saying, 'One more week.'" Though a huge "50% off" sign in her front window has caused rapid attrition of her inventory, she acknowledges that it will be a big job, in the end, to pack up the remains and move out. It will be a sad job, too. "I just enjoy being here so much, I'm going to miss it terribly," Orr says. "Just being around books all day, that's all I ever wanted to do." But, she concedes, "It's time." Elizabeth Orr, née Pedley, was born in England on June 12, 1927. She had one brother, who is now deceased. Hers was a book-loving family, she recalls, and from the time she was 12 or so, all she wanted in life was to have her own shop. That, and to move across the pond. "As I got into my teens, I thought, I'm going to go to America; I had been reading about it," she says. "But I had to be 'of age' to go." She discovered it would be easier to immigrate to Canada, and selected Montréal. "I looked it up on a map and read about it, and thought, When I'm ready and able, I'll go into America." And so, at the age of 18 or 19, Elizabeth arrived all by herself in Montréal. She was fortunate, she says, to find a job at a bookstore owned by a British company. She learned French to get by in her new bilingual city. And she met the man she would marry, James Orr. The couple took to visiting Burlington. "We used to come down here on weekends," Orr says. "I liked the town so much, the lake, being able to walk around. It attracted me very much." Finally, they decided to move to Vermont's Queen City, and purchased the Everyday Bookshop from its original owner. After the couple divorced, Elizabeth continued to run the business. Some facts in the store's history are elusive. No one interviewed for this article - including Orr herself - could quite recall when she and her husband bought it (around 1967, according to Burlington Free Press archives). Also difficult to pin down: whether its original College Street location was the one now occupied by Stone Soup, or next door; how long the shop stayed on Church Street in the current home of Yankee Candle ("decades," guesses landlord Ernie Pomerleau); and when Orr returned to College Street in her present downsized quarters (15 years ago?). Even the Secretary of State's official business list divulges only that the name Everyday Bookshop was incorporated in 1943. Stick around long enough, and such details become immaterial. 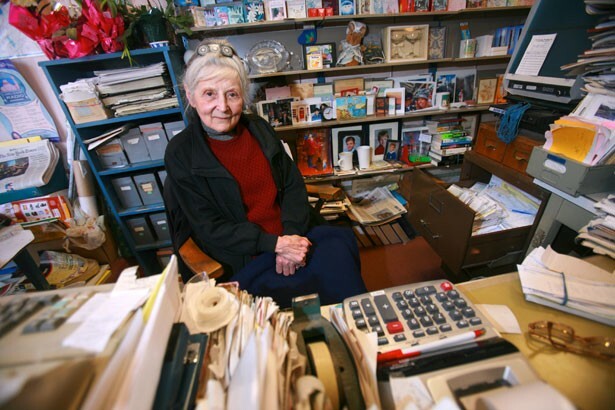 To old friends, customers and even landlords, the Everyday Bookshop is an "institution," and Elizabeth Orr has simply always been there. "She's been a tenant of ours since the beginning of time," is how Pomerleau puts it. "She is very special - the prototypical little English bookstore owner. Everyone loves her." For this story, at any rate, "The spirit is more important than the facts," suggests Avery Rifkin. Co-owner of Stone Soup - the café across the street that may have been Orr's original location - he says he met her when he came to town in 1989. Since his restaurant opened 10 years ago, Rifkin and his employees have kept up a neighborly exchange with Orr: "She brings us The New York Times and The Burlington Free Press, and she can take food from here," he explains. "She keeps track of it somehow; I've never kept track and don't need to." For the past four months or so, Rifkin notes, Orr has had so much trouble walking that he and his coworkers bring her snacks at the store. Sometimes he takes her out to dinner, and he also gives her occasional rides to the doctor. "I see her almost every single day," he says. Burlington artist Tony Sini, whose Church Street studio is nearby, is another friend and frequent chauffeur for Orr's weekly visits to the hospital. He's been getting his New York Times from Everyday for 20 years. "I usually get my Friday paper for free," Sini says with a chuckle, "because she remembers I took her to the hospital the previous day." He plays music for Orr in the car on those rides, and recalls the day she heard Bob Dylan's Blonde on Blonde album for the first time. "She said, 'This is like poetry,'" Sini remembers. "She was really listening to the words." Indeed, an affinity for words has defined Elizabeth Orr's life - though, asked to name her favorite books, she shakes her head and says, "There are too many to name." If titles and facts and dates have become hazy in Orr's own mind, the memory of her tenacity will certainly live on in Burlington. "She's a retail warrior," suggests Ron Redmond, director of the Church Street Marketplace. "People have so much respect for her." Some friends say they've been trying to get Orr to retire for years, or at least take a vacation. "But that store is her life, her home, her spirit," Rifkin says. And she embodies the kind of "mom-and-pop businesses that are practically extinct," he adds. "They're there every day to smile or growl at you. That's fading fast as these people disappear one by one." Perhaps so. But at least, unlike so many independent booksellers, Elizabeth Orr can say it wasn't big-box stores or the information age that drove her out of business. Regardless of difficulties, she has stayed on her own terms, and she's leaving the same way. And besides, she doesn't plan to "disappear" just yet. "I'm thinking of selling my house and finding an apartment right downtown," she says. "I can still hobble around. I'd like to be where I can walk to everything and do the things I've not had time to do." And, she concludes, "I'm looking forward to catching up on my reading."